ibis Styles Budapest City hotel is located on the bank of the Danube river near the city center offering great views to the Gellért Hill. It is a perfect location with the most comfortable access to both the financial and historical parts of the city. Have a really good night sleep in one of our 130 rooms that are bubbly with energy and huge comfort. 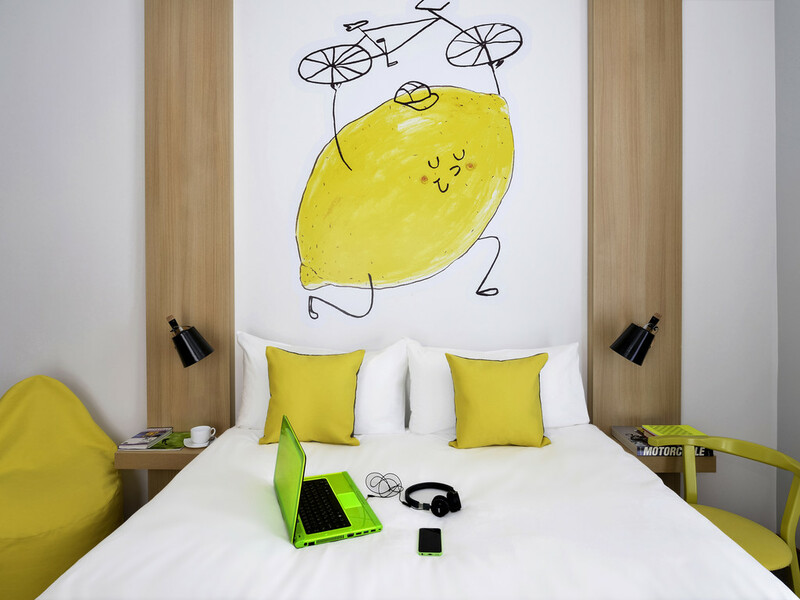 All-you-can-eat tasty buffet breakfast, unlimited WIFI access and many more extras that don't cost extra: hospitality corner, kids' corner, special family offers with games and other surprises in a stylish modern hotel boasting a funny bicycle theme. Cultural experience provided by the Palace of Arts and the National Theatre as well as the Ludwig Museum are within walking distance. For more information you can contact our staff anytime. 130 bedrooms - a good variety of double and twin options. All come with LCD TV, direct-dial telephone, in-room safe, hair dryer and WIFI. We had a great time one to short. We were walking distance from Market and the hop on hop off which was very convenient. Breakfast was great. Only problem was the morning we were to be picked up by bus. They would not let us have breakfast until 7:00. We left at 6:50 and the breakfast was ready and available. Just not to us. Very nice hotel, great location, welcoming staff. everything was superb, the only thing which i didn't like was the door slamming which heard in the evening. the mechanism is set too firmly. most of the guests did not bear it in mind. otherwise perfect. Very much enjoyed the stay in the Ibis Styles Ibis City in Budapest. Good rooms, good breakfast, helpful smiling staff. Amazing hotel to stay at very central to the city centre and all public transport right outside. The staff couldn’t do more for us! Room was very spacious with large toilet and 2 balconies! Clean room, very comfortable bed, basic but solid equipment, nice self-service breakfast. Polite and efficient hotel staff and good atmosphere. The hotel and room was clean, the staff was helpful, a bit noisy at night because of the busy road in front of the hotel. I would love to stay here again. The location was perfect. The breakfast was one of the best selections I've seen. The staff was very attentive and able to answer all questions. Good and clean hotel but the air condition did not work. Booking and check in: all is smooth, no problem at all. Location: OK. Room, general: clean, nice décor, quite comfortable, towel also clean. Breakfast and service: enough choices and good service. Negative point: I stayed during spring. Did not expect the room was so warm, even hot. The AC did not work, only made a loud noise but warm air came out. If I opened the window, it was too noisy since the room was facing the main street. I have asked helped, but the employee from the front desk could not solve it. Very clean, easy hotel to find and in a good location. On-line check-in was very efficient. Warm welcome at reception. Excellent breakfast. Room was somewhat hot; i did not use the air conditioning because it was too noisy. I solved the temperature problem by opening the door to the balcony and that worked fine for me. Great hotel with friendly staff and convenient location. The hotel was clean, staff was friendly, and hotel was in a great location. The only thing I would like is for the bathroom to have either shelving or hooks, or something to accommodate toiletries. A bit disorganized at registration. Possibly need better technology. Room was very warm. Had to open windows to sleep-air conditioning system seemed to not be on. Breakfast was wonderful. Very clean. Staff helpful and accommodating. While not centrally located the hotel is within easy reach of the city center, castle hill, and other areas by tram. Helpful staff, quality breakfast, clean and quiet rooms. I stayed 3 nights and made my check in online before arrival. Room was ok, not large not small. Carpet is a bit old. The thema was nice, bycycle and riding. Enviroenment friendly hotel. Very good service at all times comfortably room very clean, good breakfast I cannot fault it. Room was hot with no air conditioning. The traffic noise was so bad we could not open the windows. The staff all appeared to be very young and not attentive to details.